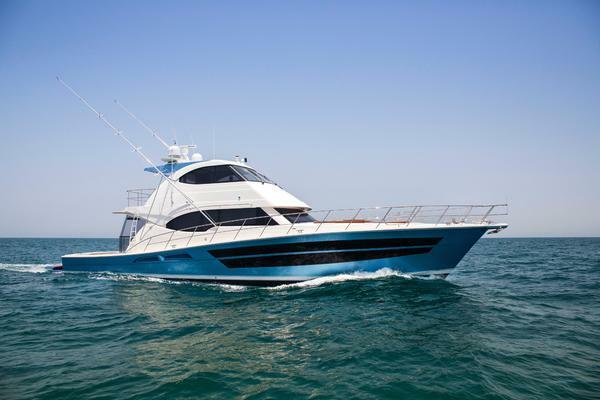 The Viking 74 took luxurious yachting and big game fishing to a new level. 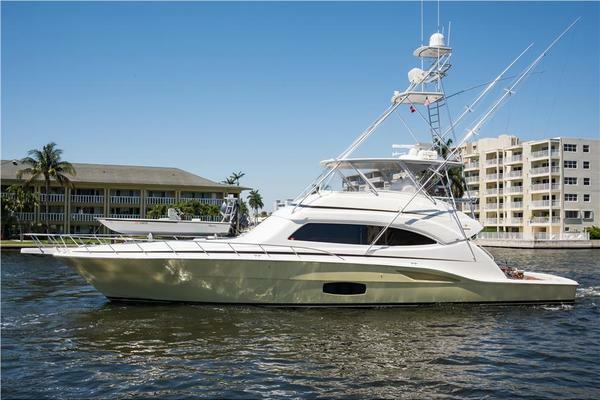 United Yacht Sales Emerald Coast would love to guide you through a personal showing of this 74' Viking Enclosed 2007. This yacht for sale is located in Jupiter, Florida and priced at $2,100,000. For a showing please contact us by filling out the form on this page and we will get back to you shortly! VIP: The VIP Suite is forward and features custom wallpaper and carpeting with a custom teak headboard over a center-line queen pillow top mattress topped with a quilted bedspread and (4) large storage drawers underneath. Teak storage cabinets line both sides of the bed accompanied with (6) overhead teak cabinets, a lovely teak shelf, and a spacious, cedar-lined, teak hanging locker offering ample storage. The VIP has mirrored bulkheads and a bomar hatch. The suite comes complete with a 26" Sharp Flat Panel TV, Direct TV, overhead stereo speakers, stereo speakers recessed in headlined tied into TV and stereo, overhead Xenon lights and decorative rope lighting, and separate switches for reading lights. Entering the en suite head, a large wall mounted medicine cabinet with mirrored doors offers generous storage, matched with a mirrored ceiling. Granite vanity counter-top with a teak facing mirror are accented with Amtico teak and Holly flooring. There is a towel bar & ring and the sink has a Grohe faucet. This ensuite has a stall shower with a shower light, AC and heat with registered soffit, and exhaust fan with vent. Port Guest Stateroom: The Port Guest Stateroom comes fitted with upper and lower berths dressed in quilted bedspreads and an upgraded single custom full bed aloft with an actuated lower bunk for storage. The stateroom has custom wallpaper and carpeting. For additional storage, there is a Teak shelf and hanging locker with cedar lining. The stateroom comes complete with a 20” Toshiba Flat Screen TV, Direct TV, a DVD Player, Stereo speakers recessed in soffit - tied into salon stereo, and overhead Xenon lights and decorative rope lighting. Entering the en suite head, a large wall mounted medicine cabinet with mirrored doors offers generous storage, matched with a mirrored ceiling. Granite vanity counter-top with a teak facing mirror are accented with Amtico teak and Holly flooring. There is a towel bar & ring and the sink has a Grohe faucet. This ensuite has a stall shower with a shower light, AC and heat with registered soffit, and exhaust fan with vent. Starboard Guest Stateroom: The Starboard Guest Stateroom is carpeted with Majilite wall coverings and comes fitted with upper and lower berths with upgraded twin mattresses dressed in quilted bedspreads. For storage, there is a Teak hanging locker with cedar lining and storage drawers underneath. The stateroom comes complete with a 20” Toshiba Flat Screen TV, built-in overhead speakers, Stereo speakers recessed in soffit - tied into salon stereo, overhead Xenon lights and decorative rope lighting, and Temperature controlled AC and Heat. Crew Quarters (5th Stateroom): The Crew’s Stateroom comes fitted with upper and lower berths with upgraded orthopedic mattresses dressed in custom fabrics and a large upper bunk with a teak sea rail. There are (3) mirrored storage cabinets above top bunk and below. The stateroom has custom wallpaper and Amtico teak flooring with a watertight access door to the engine room. For additional storage, there is a Teak nightstand with (3) drawers and a hanging closet. The stateroom comes complete with a 20” LED Toshiba Flat Screen TV, a DVD Player, and overhead lighting. Entering the en suite head, there is custom wallpaper, a mirrored backsplash with a Granite vanity countertop, overhead lighting, a mirrored ceiling, Amtico teak and Holly flooring, a Magnum Opus head, a stall shower with seating, and silver Grove fixtures for the faucet, shower, towel bars and rings. Head is equipped with 110V outlet.